Imagine if you could travel through the eras of J. K. Rowling's Wizarding World! What would you pack if you were going to 1920s New York? What kind of beasts would you imagine finding in Newt's case? What do you think it would be like to study at Hogwarts School of Witchcraft and Wizardry, or to fight Lord Voldemort in the Battle of Hogwarts? 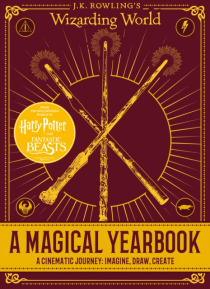 Packed with fun activities and pictures from 'Fantastic… Beasts and Where to Find Them' and all eight Harry Potter films, including an eight-page fold-out Wand and Spells Guide and full-page posters.